We want you. Yes, you with the burning passion to unleash that inner beastmode in a sport that requires determination, strength and stamina. Have you heard of Touch Rugby? Though it has the word, “Rugby” in it, Rugby and Touch Rugby are two very different sports! Unlike conventional Rugby, Touch is a limited-contact sport with the tackling of opposing players replaced by a touch. Each attack consists of only 6 touches, before possession of the ball changes over. Every time a touch is made, defenders have to back 5 metres before they can proceed to make another touch. 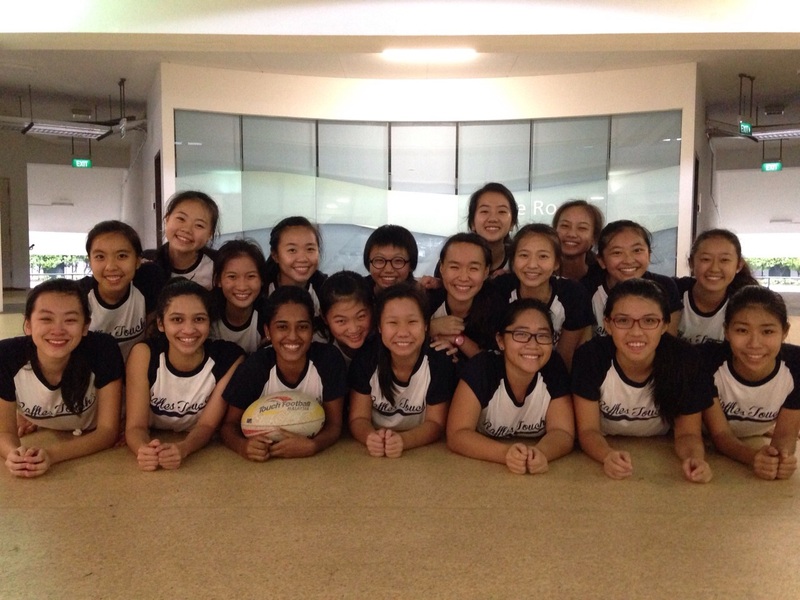 In Raffles Touch Rugby, we train really hard to constantly improve as a team and foster a strong, undefeated team spirit. Working cohesively together as a team is no easy feat, especially under great pressure and physical demands. But the amazing team spirit built within each batch fills each “Trugger” with the passion and zeal we need to pull through and carry on. Touch Rugby may be a completely alien sport to many of you now. You may be unsure as to what the trainings will entail and whether you will enjoy the sport. But rest assured, you’re not alone! Most, if not all of us, were new to the sport prior to joining Touch. As long as you keep an open mind, are keen to learn, and don’t mind getting muddy at times (it’s fun, really! ), there’s no reason why you shouldn’t join us and give this sport a try! With our very friendly, approachable, and talented coach, Weigen, who is always there to provide encouragement and support, there is simply nothing to fear! Some prerequisites include being agile and having ball sense. These are very important in the sport and will be tested during the trials. Some drills that will be tested during the trials are agility ladder, sprints and lateral passing. Besides agility and speed, communication with your teammates is very crucial in Touch. It is certainly challenging and tiring to have to communicate with one another throughout the game, but being vocal further contributes to the clarity of roles and effectiveness of teamplay on field! There will be plenty of opportunities to brush up on these skills during our trainings, which are held on Tuesdays and Thursdays from 4.30pm to 6.30pm. The intensity of trainings will increase prior to season and matches. We get the opportunity to participate in various competitions, the most important being the JC League held from March to May. The other tournaments include the NTU Touch Attack, Todaks Dive Touch, Clifford Chance Touch Championship and Asian All Schools Championship. These tournaments provide us with the opportunity to put our skills to the test and learn many lessons on field. At this point, we hope you’re all hyped up and ready to join us! See you at the field for a free-of-charge mud spa!